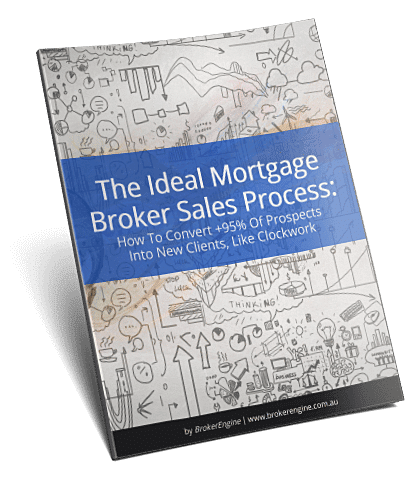 One “inconvenient truth” of mortgage broker lead generation and marketing is that there are far more potential clients who will be “ready to go in future” than are “ready to go right now”. Most mortgage brokers are strong at engaging with the ready to go right now group, because the payoff is tangible and immediate. But it’s the “not ready to go right now” cohort who actually represent the greatest future value to your firm, because there are a lot more of them. In this article I’m going to detail the lead nurturing and prospect re-engagement systems and processes I use to convert today’s “not ready” leads into tomorrow’s future clients. 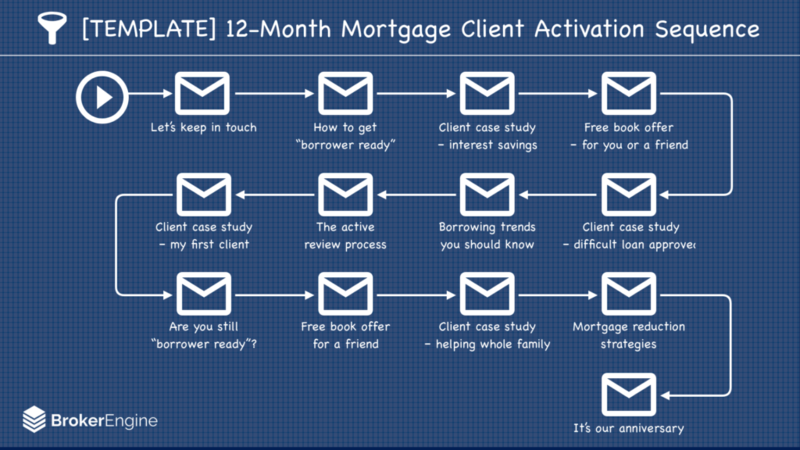 While lead generation is one of the core functions of a thriving mortgage broking practice, the reality is the different leads are in different stages of readiness. I divide inbound leads up into 4 categories which I call (very creatively!) A, B, C and D.
Dealing with the HOT (A) leads is straightforward – I just run them through a best practice mortgage broker sales process to advise on an appropriate course of action and secure their commitment. With COLD (D) leads, I usually politely advise that we are unable to help at this time. 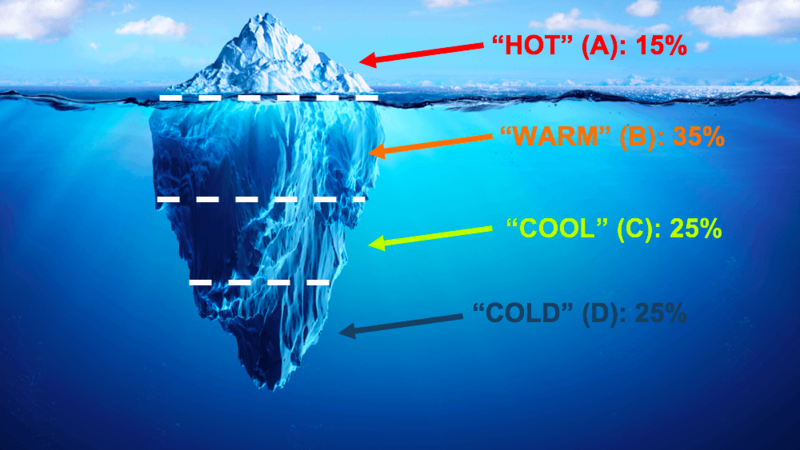 The focus on this article is about what to do with the WARM (B) and viable COOL (C) leads, which can comprise up to 60% of total lead volume. 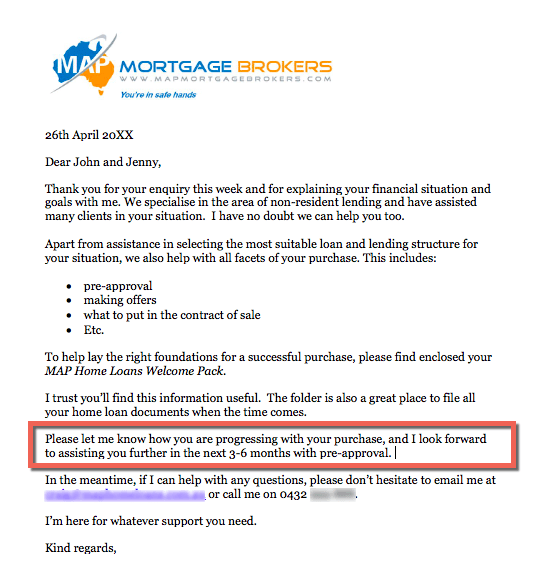 What are some practical examples of “not ready” mortgage clients? The prospect who just fixed his loan for 2 years, just prior to coming into contact with your practice. The aspiring investor who hasn’t chosen a property yet, or who doesn’t quite meet policy requirements. The first home buyer couple who have almost saved their required deposit. The prospect who has just started a new job on probation. If a prospect is initially impressed with our client engagement systems, they’re much likely to want to come back later when they’re ready to go. We use a standardised sales process which aims to create a pleasant and structured experience for clients. One of the important steps is to send a “shock and awe pack” to warm prospects. This is a big folder of materials to help educate the prospect about our brokerage and the mortgage process in general. (In our 12-Week Practice Accelerator Program, we give you templates to build your own Shock and Awe Pack so you can get this live much cheaper and faster). It will usually be obvious when a suitable time to revisit the prospect’s situation will be. Wherever possible, I book a specific calendar appointment in the future to reconnect with the prospect, and send a confirmation email and/or letter. Everyone is super-busy these days. Prospects will forget about you unless you stay top of mind with relevant communications. We add “not ready” prospects to our email Nurturing and Activation List. This is not the same as an “RBA updates list” (although if that’s all you’ve got, that’s better than nothing). These are messages that are designed to ensure the prospect’s level of enthusiasm for our services remains high. It’s designed to activate the dormant prospect into an active client when the time comes in future. Let’s keep in touch: initial email indicating that we’ll be keeping in touch on a regular basis, and that we’re here to help. How to get “borrower ready”: tips to help the prospect get their finances in shape for a smooth approval, including tips on credit file, living expenses etc. 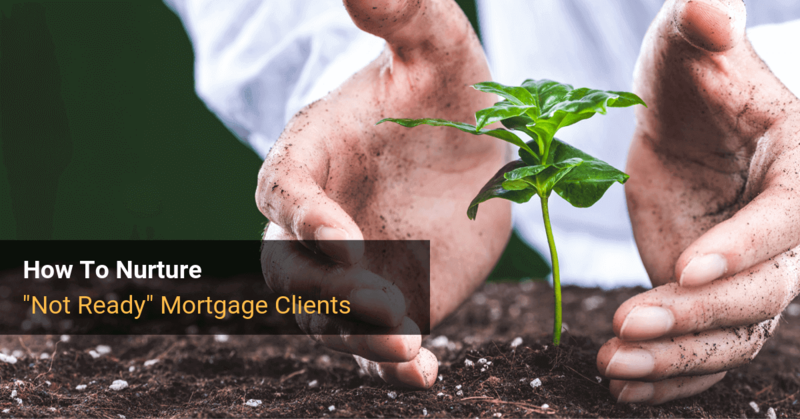 Mortgage reduction strategies: article with tips on how to knock down a mortgage faster using extra repayments, offset account etc. 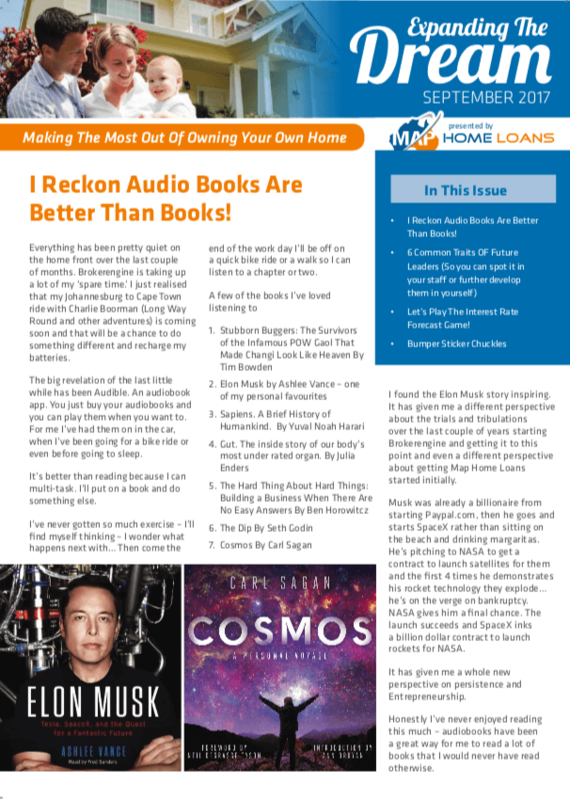 How many mortgage brokers produce a PRINT newsletter? This in itself is a good reason to create one. You get to show up in a unique way. We are more likely to send the print newsletter to higher-end warm leads than to every lead, since there is a hard cost associated. We use Zac at Newsletter Marketing Systems to create my newsletter every 2 months. If you let him know I sent you, then he’ll be able to deploy some of the templates we use on your behalf. Here’s a screenshot of a recent newsletter cover. Notice that the content is designed more to create a connection with the prospect, than it is to overwhelm them with recent happenings at the Reserve Bank. Depending on the prospect’s situation and the nature of the opportunity, we also diarise proactive followups via phone or text message. Quarterly or Bi-annual phone calls and/or text messages. Triggering a call or other communications 70 days prior to fixed rate expiry. This timeframe is designed to beat the banks, who will usually commence retention activity 60 days out. As the requirements for each situation can vary considerably, we manage these reminders by creating a followup task in the BrokerEngine software for either myself or a team member to action. When a prospect is 6 months to 2 years away from being able to work with you, that can feel like a long time. It’s all to easy to leave these “future deals” to chance. The reality is that if you do that, you usually won’t end up getting the business, regardless of how enthusiastic you think the prospect is in the moment. When you build a robust lead nurturing system, the reverse is usually true. You’re now in the box seat to get that future business. And it’s funny how quickly 2 years can come around. That’s one less deal you’ll have to worry about then! This is a high-level overview of one of the many practice growth strategies we cover in our 12-Week Practice Accelerator. Please consider joining us if you’d like to accelerate your practice growth.